RRC Patna Recruitment 2019: This is a good opportunity for all candidates who want to make their career in the Railway Sector and are eagerly waiting for the RRC Patna Apprentice Recruitment 2019. 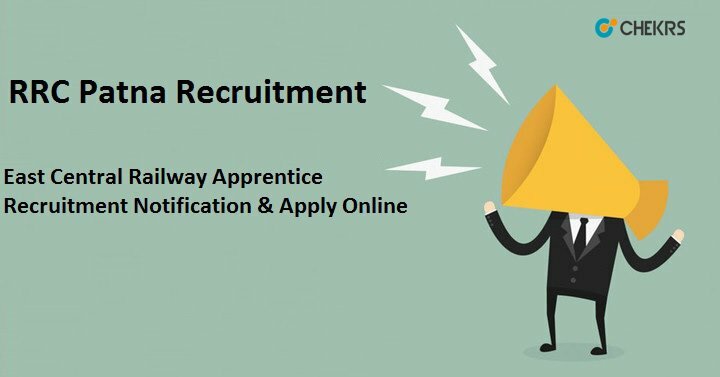 Online Applications are invited from interested candidates for engagement of Act Apprentices for imparting training under the Apprentice Act 1961 in the designated trades at Divisions/Units in the jurisdiction of East Central Railway. Candidates should be completed the East Central Railway Recruitment 2019 Online Application on or before the last date which is released by the Railway Recruitment Cell (RRC). You can get the complete details from here. The Railway Recruitment Cell, Patna has been released Apprentice Recruitment 2019 Notification on the official website to fill up the various vacant posts. Here we have shared the complete details of RRC Patna Apprentice Recruitment 2019 such as eligibility criteria, age limit, education qualification, selection process, how to apply and more details. Railway Recruitment Cell has been released an employment notification regarding RRB Patna Recruitment 2019 on East Central Railway website. The East Central Railway, RRC has announced the Apprentice Recruitment notification for various division/ units. Candidates who are finding Government Vacancies you just need to go through the table provided below. Candidates must apply for RRC Patna Apprentice Application Form 2019 via online mode. Candidates who are going to appear for RRC Patna Recruitment 2019 are needed to fulfill the eligibility criteria according to their posts. The candidates should have completed 15 years of age and should not have completed 24 years of age as on 30.01.2019. The Upper Age Limit relaxable for the specified category will be based on the RRC Norm or Conditions. For SC/ ST/ PWD/ Women Candidates: No Fees. Click on the Important Information link and read carefully. Click on “Online application for engagement of Act Apprentices for Apprenticeship Training in East Central Railway”. Click on Click Here to Register. Fill the Required Fill with correct information and click on Register Button. Registration Number and Password will be sent to candidates registered e-mail ID. Fill the Personnel, Education Information. Before submitting the application form, candidates have to check all the entries made by their or its correctness. Candidates can take a printout of application form for future uses. Selection for Apprenticeship training will be on the basis of merit list prepared in respect of all the candidates who apply against the notification for a particular Division/Unit. The merit list will be prepared to take the average of the %age marks obtained by the candidates in both Matriculations (with minimum 50% (aggregate marks) and ITI examination giving equal weight age to both. Go through the following table and you can check the latest updates of various RRB Jobs. Our website provides you with the latest Job Openings in the Government Sector under various departments. Keep visiting our site www.jobs.chekrs.com for getting frequent alerts about the RRC Patna Recruitment 2019. In the case of any query or review, you can drop your valuable comments in the comment box.